Washington has influence all around the world, and he had an effective intelligence operation in the Revolutionary War. New Book from UVA on GW Prayers ---- "The Ways of Providence"
Some years back, in November anno domini 2001, "George Washington" when visiting his former Minister of State "Thomas Jefferson" in Charlottesville for the Governor Jefferson Thanksgiving Festival sponsored by Providence Foundation, took some time to go and visit his old papers at the University of Virginia George Washington Papers Project as you can see in the accompanying painting in light. At that time, GW met Mr. Frank Grizzard, Jr., and discussed briefly the Prayers of George Washington from his early days as a Man doing GW - God's Will in this world. Recently, in a.d. 2005, Mr. Grizzard has published a book on the GW Prayers. This journal entry is a commentary, or book review, of that new book on GW. The short of this review is that Frank Grizzard, Jr. has done a good deed with this book in showing the images of the penmanship of powerful passionate prayers purported to be penned by a 20 year old George Washington. Second of value is the fine article written in anno domini 1907 by Rev. W. Herbert Burk, founder of the Washington Memorial Chapel at Valley Forge that in effect anticipates and effectively refutes the negative analysis of the author Grizzard. Yet give Grizzard much credit for "intellectual honesty", for using the word "cursory", meaning "shallow", to describe an examination comparing Washington penmanship samples from age 20 and age 22; and for including an essay under the covers of his book that seems to persuasively refute his negative analysis. How many other authors would include a writing of another author that debates their own position, and in the eyes and mind of this Washington scholar, effectively refutes his own written conclusion? Grizzard obviously likes a lively debate in the minds of his readers. 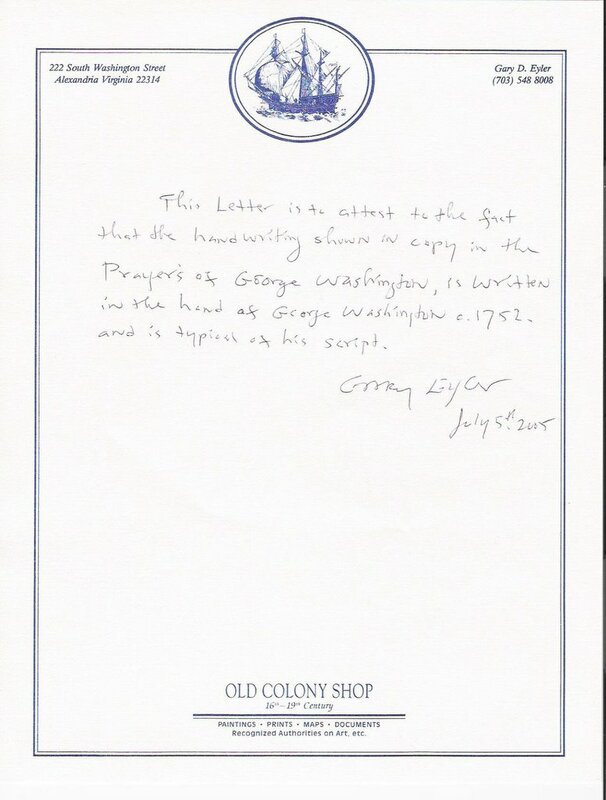 Still further, while the author Grizzard seems to want to deny the authenticity of the prayers being "Washington", he fails to present to the reader a letter from an expert on George Washington's penmanship, which experts have noted changed in style over a period of years. 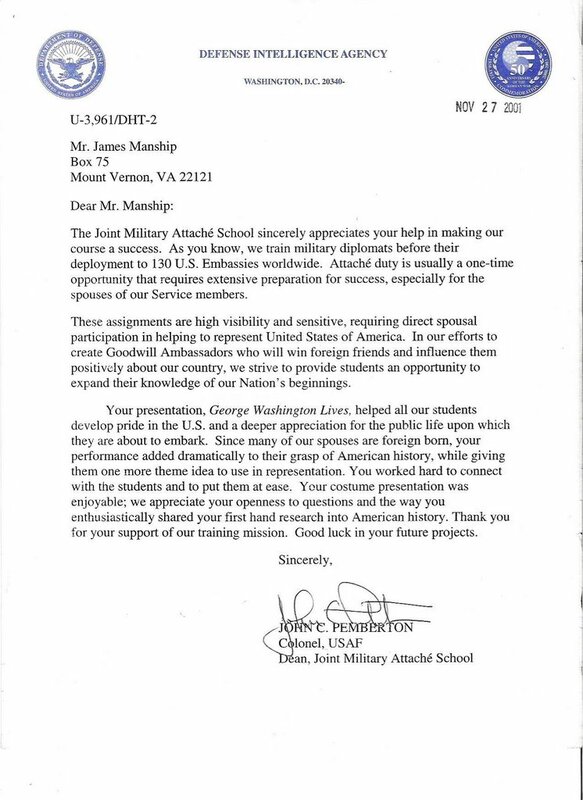 Read on below to see a copy of a letter from a penmanship expert who evaluates documents for Mount Vernon, and his professional opinion is the "handwriting" is characteristic of George Washington, which of course, refutes the position of the author Grizzard in this book. And what about the professional opinions of the penmanship experts a century and more ago that also said the prayers were penned by George Washington? Even consider that the penned prayers could indeed be "Washington Prayers" but not composed, or even penned by George Washington, but rather penned by his older brother Lawrence, his father Gus, his grandfather Lawrence, or his great great grandfather John, or even back to his great-great-great-grandfather, Rev. Lawrence Washington. One review on the internet states that the prayers derive from the time of King James that would correspond with some of the years of the life of Rev. Lawrence Washington. So the prayers may have been greatly treasured by George Washington's because the prayers had been penned by a relative and passed down to the young George, or indeed, the prayers may be both composed by George Washington and in his penmanship. The long version of this book review is provided below. Years ago, just before Thanksgiving anno domini 2001, when GW traveled to Charlottesville for the wonderful annual Governor Jefferson Thanksgiving Festival where folks from past and present gather to celebrate the Governor's Proclamation of Thanksgiving to God and to re-enact the raid of the British, and the Virginia "Paul Revere" ride of Captain Jack Jouett that allowed the Legislature and the Governor to escape capture during the year a.d. 1781 before the British were able to be trapped and defeated in Yorktown, he, GW that is, visited the University of Virginia Library where many of his old letters and papers are being stored and catalogued for safekeeping and publishing. 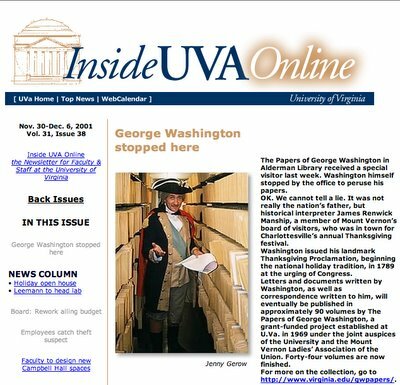 That George Washington Papers Project at Mr. Jefferson's university, the University of Virginia, is liberally endowed by the National Endowment for the Humanities in Washington. For the most part fitting, though liberally or liberal has a connotation that while it fits well with current spending patterns of Washington, does not fit well with George Washington. 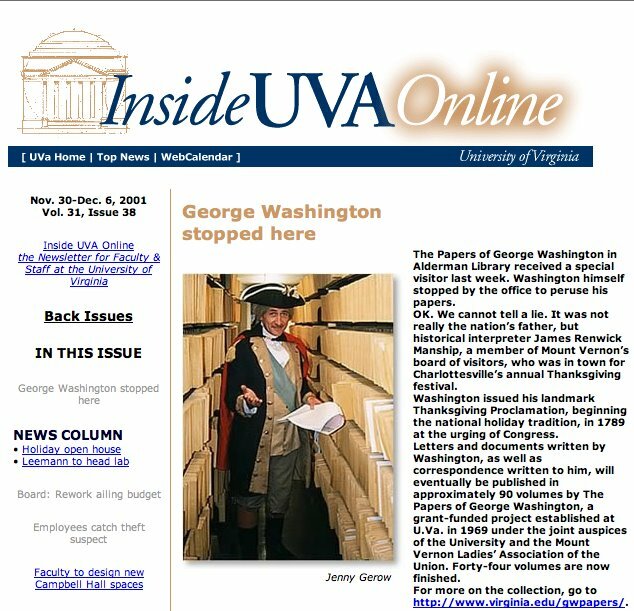 During that visit to the Alderman Library at the University in a.d. 2001, shown by the photo, I met Mr. Frank E. Grizzard, Jr. who was a most personable and rather well informed academic working at the GW Papers Project; I removed from my coat pocket close to my heart the prayers of George Washington, that he titled "Daily Sacrifice", and if you read the first of those twice daily prayers you will learn the historical relevance of the title that the young George Washington chose. 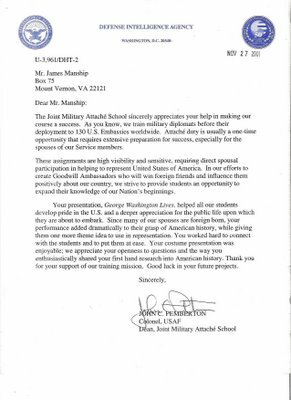 I remember how I selected one of "my" letters and read it with the passion its elegant phrases deserved, and the two staff members thought I was reciting words of Washington from memory. When I showed them the words on the paper before me, they were a bit surprised, being there in Charlottesville, home of Thomas Jefferson, there is a natural bias to think of eloquence in writing as being a near monopoly of their local favorite son. Now they became more aware that there are golden nuggets in the tremendous mass of the wise words of Washington. I then remember how they showed me the three index books for the writings of Washington, Jefferson and Madison. The index book for Washington was about 1 and 1/4 inch thick, whereas the one for Jefferson was about 1/2 inch thick and the one for Madison about 3/8 of an inch thick. Using what my Advanced Public Speaker Institute friend Tom Antion calls "the thud factor", Washington as a writer carries more "weight" that either Jefferson or Madison. "Literary power and statesmanship were combined in George Washington, the greatest political leader of his time and also the greatest intellectual and moral force of the Revolutionary period." "...Few people realize that he was also the most voluminous writer of his period, and his principals of government have had more influence on the development of the American commonwealth than those of any other man." "Of all the disposition and habits which lead to political prosperity, religion and morality are indispensable supports." Washington's Farewell Address goes on with many more wise words, and this www.WashingtonLIVES.us site will post the entire document in an Archives entry for September a.d. 1796, for our reader's convenience, or post a link. Once back in a.d. 1998 or so, I discovered on the George Washington Papers Project web site an analysis of the books in the library of General Washington, also a Planter, Surveyor, and Vestryman, numbering about 1000 volumes, that 40 books were on military matters, and an equal number on faith matters, with fewer numbers in other areas of his work. The conclusion could be derived that Churchman Washington was equal to General Washington. In recent visits, I have not been able to find that same gold nugget of information. As is said on the National Archives building in Washington, "The Past is Prologue." The prologue above sets the stage for the present entry about the new book (a.d. 2005) by Frank E. Grizzard, Jr. with the imprint Mariner Publisher, Buena Vista and Charlottesville, Virginia. 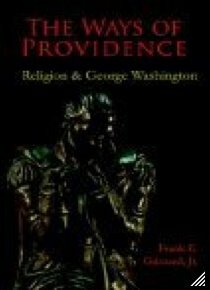 The book title is "THE WAYS OF PROVIDENCE Religion & George Washington". and their children another generation." There is a great deal of "intellectual honesty" in this small volume, for Grizzard includes an address titled "WASHINGTON'S PRAYERS" from the Reverend W. Herbert Burk, who founded the magnificent Washington Memorial Chapel in Valley Forge, that anticipates the ever typical reaction of skepticism and even cynicism of "the academy" to matters of faith. "An age whose virtues are philanthropic, whose defect is lack of spiritual perception, and whose characteristic vice is irreverance, can hardly fail to receive benefit from the publication of the prayers of one honored by men of all faiths, and even of none, as is George Washington." Yet back on page 51, sadly Mr. Grizzard seems to succumb to the desire for acceptance by the intellectual elite of "the academy" -- "whose defect is lack of spiritual perception". Grizzard writes: "The catalogue of the sale was prepared by Philadelphia auctioneer Stan V. Henkels, who asserted that the manuscript was not only in Washington's own handwriting, written when the future Father of His Country was about twenty years of age, but that Washington even composed the prayers himself. Both claims are patently false." A few lines below, he writes: "...others continue to challenge its authenticity. Tens of thousands of genuine Washington manuscripts have survived to the present, including many from the youthful Washington, and even a cursory comparison of the prayer book with a genuine Washington manuscript reveals that they are not the same handwriting. (See illustrations.)" From Noah Webster's a.d.1828 Dictionary we learn the precise meaning of the word "Cursory" includes superficial and careless. 1. Running; hasty; slight; superficial; careless; not with close attention; as a cursory reading; a cursory view. Granted a "cursory" comparison reveals differences, but also reveals similarities. Mr. Grizzard is not likely a penmanship expert as were several experts that Mr. Henkels referred the Washington manuscript for examination before the auction in a.d 1891. 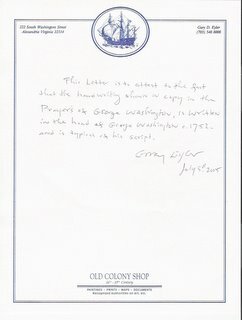 "This letter is to attest to the fact the handwriting shown in copy in the prayers of George Washington, is written in the hand of George Washington c. 1752. and is typical of his script. Gary Eyler July 5th, 2005." Printed below is OLD COLONY SHOP 16th - 19th Century / Paintings - Prints - Maps - Documents / Recognized Authorities on Art, etc. "It is a well-known fact that Washington between the years of 1755 and 1763 changed his hand from the angular to the round formation." If such be the case in an eight year period as a young adult of 23 to 31 years of age, certainly it is fair to allow that the younger George Washington's handwriting would likely vary when he was 20 or thereabouts. With a period of time since reading the book so to allow time for consideration to constrain my complaints upon initial reading, I now am quite happy to recommend Mr. Grizzard's book as a very valuable addition to the literature about the faith of George Washington. My recommendation is not so much for Mr. Grizzard's analysis in his writings, which I find faulty, but for the wonderful service he has rendered by reprinting the prayers in the penmanship of George Washington, and the fine essay by Rev. Herbert Burk that anticipated nearly a century before this book was published many of the arguments the author makes, and persuasively refutes those arguments. In addition, the old saying "You can't tell a book by its cover." does not apply to this cover which has a striking image of a sculpture titled "General Washington Praying at Valley Forge" by Donald DeLue, the same sculptor who created the magnificent 9 foot bronze statue at Freedom's Foundation at Valley Forge. "The most sublime picture in American History is of George Washington on his knees..."
So why do I find faulty the analysis of one who is so highly regarded as a Washington expert if the reader is to read the back cover with scholar's comments from a previous book "George! A Guide to All Things Washington" from which this smaller volume is reportedly derived? I could be laborious and detail several points, but I will limit myself to only two. "...prayers continue to be disseminated under Washington's name, thanks to their publication in the early twentieth century by William Herbert Burk (1867 -1933) as Washington's Prayers (Norristown, Pennsylvania, 1907) and later republication by William Jackson Johnstone (1867-1933) in George Washington The Christian (New York and Cincinnati, 1919). Here Mr. Grizzard reveals that he has fallen into the trap of far too many historians who repeat what prior historians have written. He writes "William Jackson Johnstone". I discovered when in May a.d. 2000, when I was traveling the country as GW and sought to learn more about the author of George Washington the Christian, I learned at the Minnesota State Library that this just so happens to be wrong. Johnstone was a professor in the Saint Paul, Minnesota area. But Johnstone was not Johnson, the author. Two amazingly similarly names of men both involved in Christian ministry and as professors in the Saint Paul area, but two different men. William Jackson Johnson was also a professor in the Saint Paul area who taught at Macalester College, and whose home where the book was likely written I went to see and photograph. By the way, Johnson was born in Davies County, Indiana where the county seat is Washington, Indiana. Unless an historian did like I did and went to Saint Paul and pored through the newspapers to learn about the difference between Johnstone and Johnson, it is a likely error, easily to be made. However, Grizzard writes to finish his paragraph of page 52: "It is hoped that this republication of Burk's work with the facsimiles will help to dispel the notion that the manuscript of the prayers are in Washington's own handwriting." That is half of what he writes on the previous page, where he also disputes "...that Washington even composed the prayers himself." And I do not know if Washington did or did not pen these prayers. And neither does Mr. Grizzard, or the gaggle of other academics "whose defect is lack of spiritual perception, and whose characteristic vice is irreverance," as Burk wrote so prophetically near a century ago. Too often "historians" are more properly labeled "hysteria-ns" who run like a pack of hyenas barking at the Moon God rather than baying and obeying the call of the God of Light, Jesus. But I do know that I grew up in the same denomination as did George Washington, the Church of England, or in America after the Revolution, the Protestant Episcopal Church. I served as an altar boy and near learned the Book of Common Prayer by heart, and I see many phrases in Washington's prayers that are the same as prayers in the Book of Common Prayer. Sadly, when I first discovered these prayers of Washington in the Princeton Theological School library in a.d. 1995 after being unable to find them in the Library of Congress. I obtained several copies and gave the Washington Prayers to two bishops of the Diocese of Virginia Episcopal Church, and a bishop of the break away Anglican Catholic Church, asking each man to review them and tell me from where the prayers derived. None of the three bishops cared enough to respond to my request, which suggests to me they too are infected with the mindset of the modern seminary, which mirrors the gaggle of other academics "whose defect is lack of spiritual perception, and whose characteristic vice is irreverance," as Rev. Burk wrote so prophetically near a century ago. So I am preparing separately an "annotated" edition of the Prayers of George Washington citing the King James Version of the Holy Bible chapter and verse, and the Book of Common Prayer of the time of the youthful George Washington. And as an adult, I have come to read the Holy Bible much more than as a child, and so see many passages in Washington's prayers that are taken either directly from scripture, or with minor alteration. Now with that aside, I consider the worst issue is where Mr. Grizzard abuses the soft spoken words of a lady, the "step-grand-daughter" Eleanor "Nelly" Parke Custis Lewis, grand daughter of Martha Washington. Martha of course was the wife of George Washington. On page 47 in italics, Mr. Grizzard writes "Note that Nelly says she never witnessed Washington's private devotions." Thank God, Mr. Grizzard has the intellectual honesty to have included in this same book's covers a refutation of his own commentary. Refer to page 61, where the essay by Rev. Burk addresses the same point, where he continues her quotation, "I never witnessed his private devotions. I never inquired about them. I should have thought it the greatest heresy to doubt his firm belief in Christianity. His life, his writings, prove he was a Christian..."
The next paragraph says, "What Eleanor Parke Custis did not see, Robert Lewis, Washington's nephew and private secretary, did see. In 1827 he told Mr. Sparks that "he had accidentally witnessed his private devotions in his library both morning and evening; that on these occasions he had seen him in a kneeling posture with a Bible open before him, and that he believed such to have been his daily practice..." In an earlier paragraph, General Porterfield is quoting the same observation of George Washington, who found him "...on his knees at his morning devotions." And if none of these witnesses are seen by the skeptics of Washington's Christian faith to be trustworthy as a persons with close second hand experience, that such powerful proofs are not good enough their unrealistic burden of proof, consider on the previous page 60, where is written, "Now we know the meaning of the entry in his diary in 1774: 'Williamsburg, June 1st. Went to Church and fasted all day.' Now we know what to think of his Church attendance." And we know the depth of the devotions of Washington. How many of us today go to church and fast all day? So, in summary, while the attitude of the author seems to reveal the all too prevalent skepticism of the scholar of the modern academy, too often "over educated" so to be unable to discern the Truth, even in light of ample evidence to convict, or reveal Washington's Christian convictions, before a jury of his peers; this book does a great service by printing these powerful passionate prayers from the penmanship of George Washington, and by printing the insightful essay of Rev. Herbert Burk of near a century ago. Somehow it is appropriate, or as Washington would say "Divine Providence" that this book of his powerful passionate prayers in his own penmanship be published in Charlottesville by a man who worked as a scholar at the George Washington Papers Project at the University of Virginia. Why? Because three years before he died in anno domini 1826, Thomas Jefferson, who is widely considered by academics to be an atheist, agnostic, deist, or at best a Unitarian whose faith in Jesus is marginal at best, chose a motto for his beloved university. The motto is "And you shall know the truth and the truth shall set you free." Those are the words of the Lord of the lives of both Washington and Jefferson, the words of Jesus Christ as recorded in the Gospel of Saint John, Chapter 8, verse 32. And so it is with this book "The Ways of Providence: Religion & George Washington", the words of Washington, and many good people related or closely connected with Washington, "provide" the ways and the words for the reader to discern the Religion of George Washington. It is not easy to discern the truth in anyone's spirtual life, whether Washington, or Jefferson, or Carter, or Reagan, or "George W." (Bush), but if you work to find the truth that is Mr. Grizzard provides in the covers of this book, from the essay by Rev. 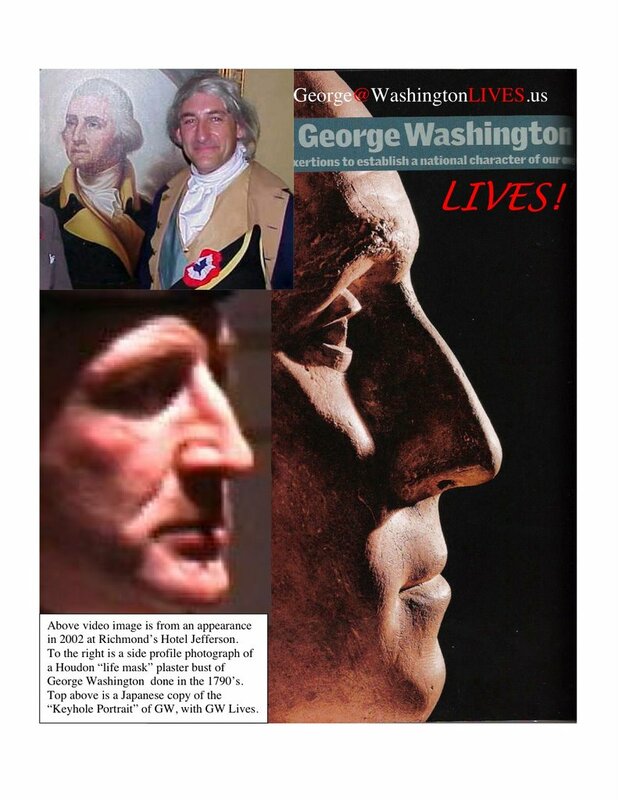 Burk, and the penmanship prayers of George Washington, it will set you free to understand the "Man for the Millenniums" George Washington, and the quiet powerful motive force in his life, his faith in Jesus Christ. As General Washington wrote to his army after the trials and tribulations of Valley Forge in May a.d. 1778, "In addition to the distinguished character of a Patriot, it should be our highest glory to laud the more distinguished character of a Christian." OK, OK, with the above hatchet job review, in the Spirit of the very young George Washington, I am not likely to get an Honorary Doctorate of Laws from the University of Virginia which has fallen away from the reverence of Jesus who spoke its motto, but one of the Laws of God is "Thou shalt not bear false witness against thy neighbor." and with my box 75 at Mount Vernon, I could not tell a lie about my neighbor George Washington, whose example we all should follow. P.S. And oh by the way, you might like to buy my compilation of the same George Washington Prayers in my PRAYER WARRIOR Washington Prayer Book - Work Book - Picture Book, that is an audio book, video book and PDF eBook that can be seen on screen, or heard on your CD player, or printed out so to copy Washington's prayers in your own penmanship so to establish a similar mind-body connection. Buy one, or both, today.